The verdict on 2010 in movies has been pretty clear: this has been a horrible year (and especially, summer) for movies. Is it possible to say that we’ve seen some awful movies recently? Yes, we have? But must this be classified as a horrible year for movies? Depends on your angle. Maybe those people who can’t see a bright spot have been subjected to too many viewings of “Robin Hood.” “Robin Hood” brought out the very worst that movies can be. It was overly long and painstakingly dull. The action was too quick to be admired. In the end, it was just a two hour trailer for a sequel no one is even interested in seeing. It seems funny to say that for the first half of the summer, the best movie was “Iron Man 2.” “Iron Man 2″ lacked the surprising fun of its predecessor. Two great villains and a surprising story were bogged down by a need to constantly promote the upcoming “Avengers” movie. It would’ve been much better had Robert Downey Jr. had just been allowed to do whatever he wanted to. The conventional superhero genre may be dead, but the graphic novel genre is just being born in an amazing new way. The ambitions and satirical edginess of the late summer pleasure “Scott Pilgrim vs. the World” cannot easily be equaled. 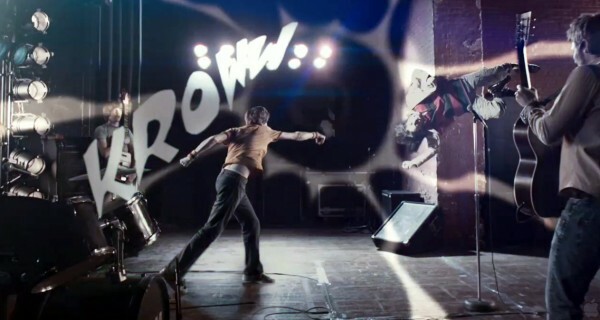 The more I think about it, the more “Scott Pilgrim” stands out as a perfect representation of our current world. It parodies video games, comic books, and hipsters like only someone who has ever been involved with video games, comic books, and hipsters could. Edgar Wright is officially the satirist film director of our generation. Of all the sequels, prequels, and remakes to grace the cinema this summer, of course the only one actually worth seeing comes from Pixar. “Toy Story 3″ is the rare sequel that not only felt necessary, but also worked to finish a story. It also brought tears to my eyes for all the right reasons. The “Toy Story” saga began with the story of a child and ended with the child going to college. Maybe the reason that this film seemed even more meaningful to teenagers than children is that it fit in so perfectly with our lives. Now, I need to think twice before leaving a toy behind. Pixar may rule the animated genre, but that doesn’t mean that competitors don’t have a chance. The scrappy debut effort “Despicable Me” didn’t have the money and talent of Pixar, but that doesn’t mean it couldn’t be worthy entertainment. This one might be meant more for kids, but it got me with its near perfect voice talent (Steve Carell, Jason Segel, Will Arnett) and little creatures called Minions. “Splice” was far from perfect, but it was without a doubt one of the most expertly directed films made in a while. 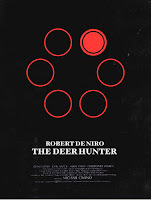 Vincenzo Natali so effortlessly vacillates between the many different moods and feelings projected by the film. Until the very conventional ending, he made “Splice” something truly special. I can’t wait to watch “Cube,” and all other films he has planned down the line. “Winter’s Bone” was a much different film than you’d expect to see over the summer. The cold, harsh Ozark landscape certainly contrasts the summer attitude. But the film played off both murder mystery and character study so well. I guess this one was just too dark and too realistic to reach out to a wider audience. Another indie that didn’t reach out as far as it should’ve was “Cyrus.” I will admit that my expectations for “Cyrus” were extremely high and that they weren’t exactly met. I certainly got a different movie than I anticipated. Still, it certainly surprised me in a good way. It was frank and understanding while being so hilarious and breezy. It also elevated Jonah Hill from good comedic actor to impressive dramatic actor. Maybe the love triangle was a little too weird for some people. The indie community can live with one true victory this summer: “The Kids Are All Right.” “The Kids Are All Right” deserves so much praise for so many reasons. No comedy in the past year has felt this warm, inviting, and all out hilarious. Not to mention, it also contains a groundbreaking portrayal of a lesbian couple as, well, normal. “The Kids Are All Right” could’ve been about a man and a woman and their relationship wouldn’t have been much different. Now, I save the best for last. It’s a pretty obvious choice, but that doesn’t mean I shouldn’t talk about it one last time. It’s Christopher Nolan’s brilliant triumph, “Inception.” Maybe I’ve talked enough about this movie, but the more I talk about it, the more I enjoy it. Now is no time for further in depth analysis. Now it is time to praise “Inception” for what it really is: the smart and original blockbuster we don’t get anymore. 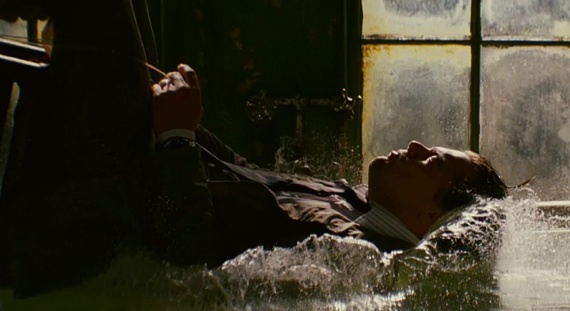 The film certainly has its faults, and it is definitely too early to put it next to the likes of “Citizen Kane” and “The Godfather.” But appreciate “Inception” for what it is, because we rarely get a film like it. Then again, with its huge box office success, perhaps studios will finally start to take risks on original ideas. That’s summer 2010 for you. It was a summer in which good ideas and imagination triumphed over the uninspired. However, summer is not over yet. “Piranha 3D” is just around the corner. This entry was posted in Christopher Nolan, Inception, Scott Pilgrim vs. the World, Summer Movies, The Kids Are All Right, Toy Story 3 on August 19, 2010 by ian0592. There are some movies that, no matter their subject matter, just give you a new sort of energy after walking out. 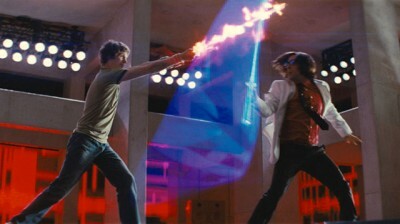 With its hilariously gimmicky comic book inspired universe, “Scott Pilgrim vs. the World” did just this. “Scott Pilgrim vs. the World” felt so fresh and inviting because it simply did its best in trying to achieve so many things. It made use of action and comedy quite effectively because it comes from a director who can mash both genres like few others working today. To like “Scott Pilgrim” and Scott Pilgrim, it is your task to throw away all of your hatreds you may have toward the film’s star. The titular hero is portrayed by Michael Cera. Scott Pilgrim is a timid bassist playing for a struggling Toronto band. Pilgrim doesn’t have as much trouble getting girls, as he does keeping them. Pilgrim can’t get over the horrible way his last relationship ended. His relationship with a girl (Ellen Wong), who’s quite a bit younger is a bit troubling. But then, Scott sees Ramona Flowers (Mary Elizabeth Winstead) and knows he has found the one. Ms. Flowers doesn’t come easy though. The girl with the constantly changing hair color has also had quite a number of bad breakups in the past. In order to win her over, Scott must battle her seven evil ex-boyfriends. With such competition as skateboarder Lucas Lee (Chris Evans), tough lesbian Roxy (Mae Whitman), and powerful record producer Gideon Graves (Jason Schwartzman), the task will prove to be just as hard as it sounds. I wouldn’t call “Scott Pilgrim” flawless (some scenes ran on slightly longer than they needed to), but I still found so few things I could complain about. Everyone involved, whether writer, director, or actor, fulfilled their roles to the highest of their abilities. When this happens, a strange sort of tangible magic occurs. It is one that can’t easily be broken. Cera made a name for himself early on as the teenager who’s too awkward for words. From “Arrested Development” until “Juno,” this image worked in his favor. Then of course, the backlash formed. Anyone who won’t give “Scott Pilgrim” a chance because they think it’s just another awkward performance will miss the point entirely. Cera has been developing a new character since “Youth in Revolt.” It’s basically a slightly deeper extension of his old one. It is awkward with a mix of pretentiousness and a lack of respect for both himself and others. Cera is no longer just playing himself. He knows how to be a comedic actor. While the film is all about Scott Pilgrim, it is not just centered on him. “Scott Pilgrim” does an excellent job developing its entire ensemble. All of the characters have very well established backgrounds and traits. Each band member and everyone else in Scott’s life have at least one certain odd defining characteristic. Aside from Cera, some of the cast highlights include Kieran Culkin as Scott’s gay and gossipy roommate Wallace. He manages to steal every scene he’s in. Then there’s Anna Kendrick, who manages to prove herself a better actress with every role. Aubrey Plaza, as the always present Julie Powers, continues to find a perfect dry humor in her monotone voice and even more monotone attitude toward life. “Scott Pilgrim” is following a new series of graphic novel adaptations that are almost jokes on the whole comic book genre itself. In addition, its the first comic book movie I’ve seen that truly felt like a comic come to life. This story is complete with onomatopoeic sounds bursting out in word form. Just like a comic book, the audience sees every Boom! and every Bam! The characters can see every one of these effects as well, giving the film a much more self aware element. I hope to credit as much of this as possible to the film’s co-writer and director, Edgar Wright. Wright has garnered a great reputation over the years for tongue-in-cheek satire of various entertainment genres. Perhaps he’s so good at it because he truly seems to know his stuff. Within all of the jokes about video games and comic books, Wright infuses a dose of satire of everything from the typical action film to the tired rom-com. Like his past efforts, Wright shows great talent for getting big laughs out of such small details. To really laugh at an Edgar Wright film, one must have a very keen eye for detail. Take for instance one moment in “Shaun of the Dead,” where if you look close enough in the background, you might spot a homeless man about to eat a live pigeon. Wright also constantly challenges what the human brain can laugh at. Wright can hurt his characters without being mean and tell jokes about gay people without seeing homophobic in the slightest bit. The action in “Scott Pilgrim” is directed in a way that is both silly and serious. As hilarious as it can be, it is also a feast for the eyes. So much effort was put into every little shot. Much of the action feels like a hybrid between a video game and a comic book, which isn’t necessarily a bad thing. In this way, the action can be seen as a comment on our current fast-paced, video game obsessed culture. It’s better though to ignore this fact and just see the film as the hilarious product of entertainment that it truly is. 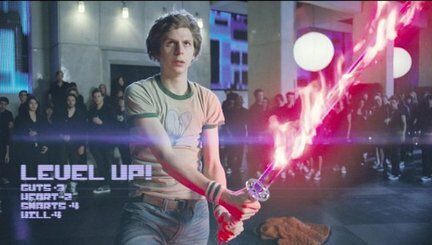 For a film that is so unique and inventive, “Scott Pilgrim” ends almost exactly the way anyone could have predicted. Yet, how it gets to that moment is a bit surprising, and extremely mature for a film like this. “Scott Pilgrim” is a film that truly cares about its characters. Think of it as the most thoughtful video game movie ever made. To all of you die hard “Arrested Development” fans out there, watch out for a few very good references. This entry was posted in Arrested Development, Aubrey Plaza, Canadian, Edgar Wright, Graphic Novel, Jason Schwartzman, Mary Elizabeth Winstead, Michael Cera, Movie Review, Scott Pilgrim vs. the World on August 14, 2010 by ian0592.